Are Coral Reef Scientists All Doom and Gloom? It has been a tough year for coral reefs – reports of widespread, severe bleaching have littered the headlines, and photos of dying reefs and distraught scientists have attracted significant attention. No one likes bad news stories, particularly politicians faced with making tough decisions on climate change, and unfortunately these reports have stimulated debate over the veracity of scientific reporting on the bleaching event, with researchers being labelled merchants of doom and gloom (see Hoegh-Guldberg in The Conversation). This debate is distracting from the seriousness of the bleaching event, and our ability to find solutions to address the decline of coral reefs. Furthermore, is it even true – are coral reef scientists really all about the bad news or are we just highlighting an urgent need for action? Last week 3500 coral reef scientists from around the world came together for the 13th International Coral Reef Symposium. 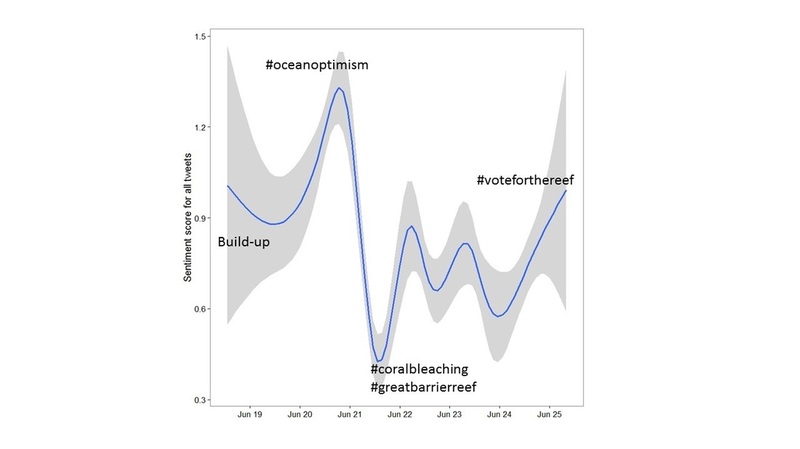 This seemed like the perfect opportunity to find out what coral reef scientists are focusing on and whether these scientists really are all about doom and gloom. 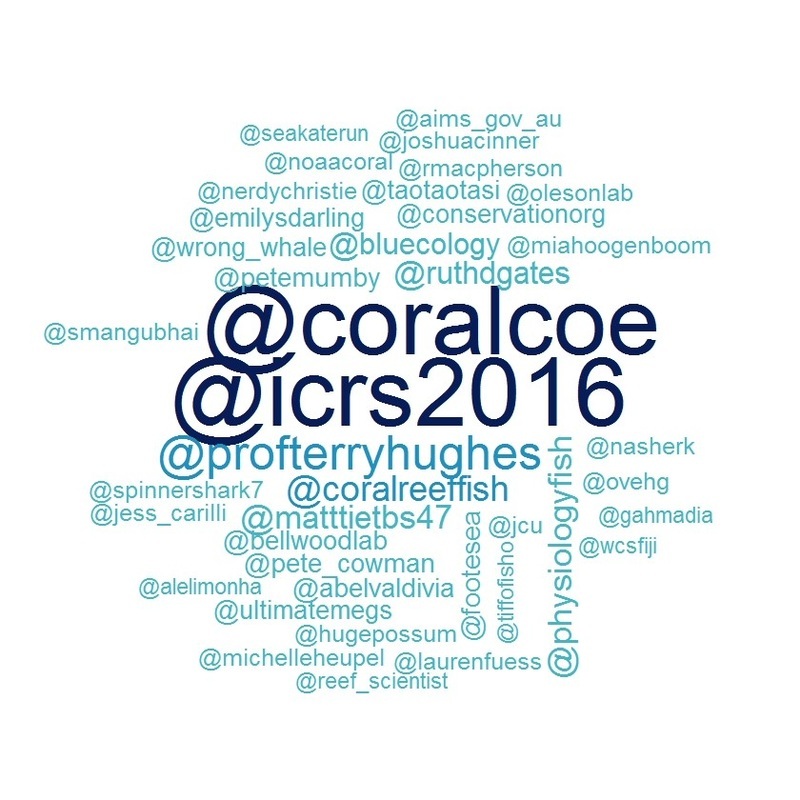 I collected tweets from the conference (using the Twitter Streaming API and labelled with the conference hashtag #ICRS2016). 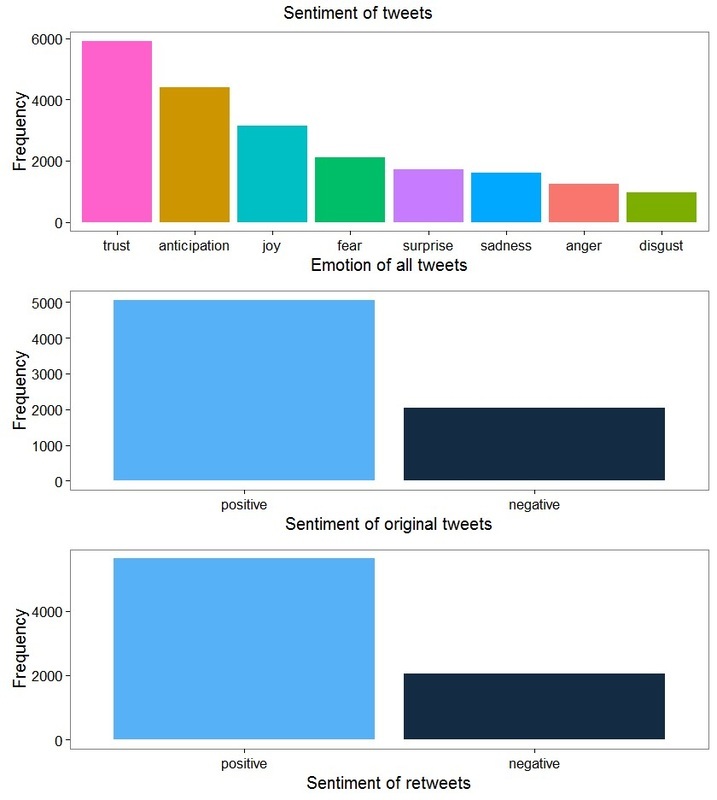 Using Sentiment Analysis, an approach often employed in marketing to understand customer opinions and attitudes towards a product or service, I evaluated the 19989 tweets collected to discover common themes, general attitudes and emotional content. First, I tallied up the most common hashtags used at the conference, separating out original tweets from retweets. Not surprisingly, hashtags revolving around coral and reefs were dominant features. 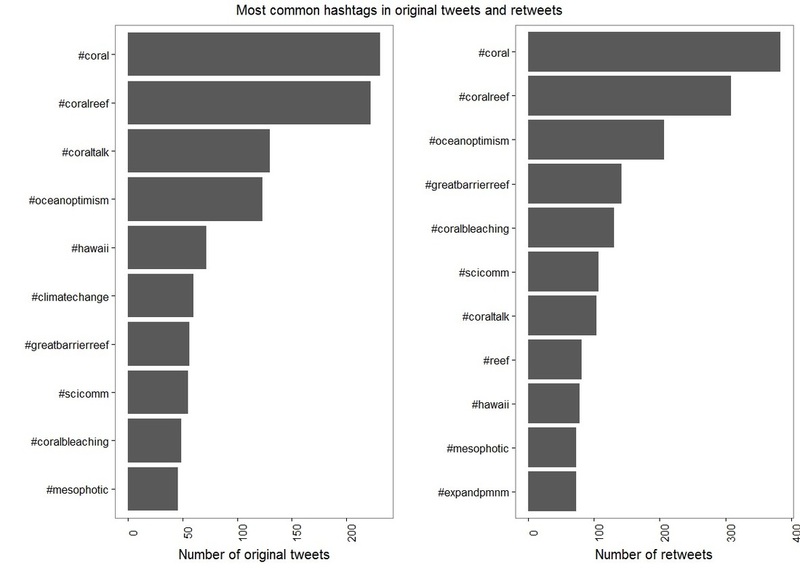 But, more interestingly, #OceanOptimism was the 4th most common hashtag in original tweets, and the third most common in retweets. #ClimateChange and #CoralBleaching certainly featured in the top ten but they didn’t dominate. ​Considering that this Centre and these scientists have been the target of the reports on scientist negativity, you might expected that many of the resultant tweets would also be negative in tone. So, I analysed the sentiment of the conference tweets, and found, counter to potential expectations, there was a strong focus on the positive in the text of each tweet; the sentiment analysis provides an emotion for each tweet, and scores it as positive or negative. Emotions that could be classified as undesirable were definitely in the minority (e.g. anger and sadness), whereas ‘trust’ dominated. In addition, for both original tweets and retweets, the sentiment was overwhelmingly positive! ​What can we take from all this? First, maybe it will help dispel the idea that coral reef scientists just like a bad news story. Second, it helps bring our focus back to solutions – yes coral reefs are in trouble, but we have the power to address this – #OceanOptimism is alive and well among scientists. It also highlights that we need to be better at ‘selling’ our story (#scicomm), so that the urgency of the problems faced by coral reefs is understood and not tuned out along with other bad news in the media. Perhaps, then we will become better at translating science into policy, so we can actively address #ClimateChange, maximise coral reef #Resilience and ensure smart decisions for coral reefs into the future.